Proprietary Name: Extra Strenghth Pain Relief What is the Proprietary Name? Extra Strenghth Pain Relief with NDC 71724-005 is a a human over the counter drug product labeled by Flpharmaceuticals Llc. 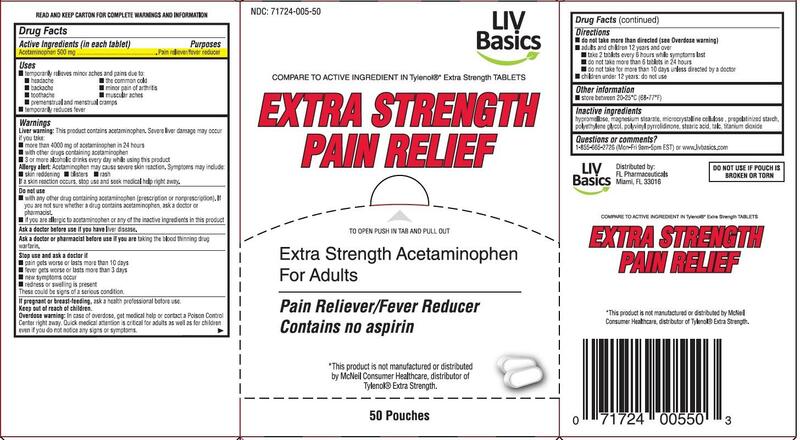 The generic name of Extra Strenghth Pain Relief is acetaminophen. The product's dosage form is tablet and is administered via oral form. Liver warning: This product contains acetaminophen. Severe liver damage may occur if you takemore than 4,000 mg of acetaminophen in 24 hourswith other drugs containing acetaminophen3 or more alcoholic drinks every day while using this productAllergy alert: Acetaminophen may cause severe skin reactions. Symptoms may include:skin reddening blisters rashIf a skin reaction occurs, stop use and seek medical help right away.Do not usewith any other drug containing acetaminophen (prescription or nonprescription). If you are not sure whether a drug contains acetaminophen, ask a doctor or pharmacist. if you have ever had an allergic reaction to this product or any of its ingredientsAsk a doctor before use if you haveliver diseaseAsk a doctor or pharmacist before use if you aretaking the blood thinning drug warfarinStop use and ask a doctor ifpain gets worse or lasts more than 10 daysfever gets worse or lasts more than 3 daysnew symptoms occurredness or swelling is presentThese could be signs of a serious condition. Overdose warning: Taking more than the reccomended dose (overdose) may cause liver damage. In case of overdose. get medical help or contact a Poison Control Center (1-800-222-1222) right away. Quick medical attention is critical for adults as well as for children even if you do not notice any signs or symptoms.Do not exceed recommended dosage. Do not use more than directed (see overdose warning)Adults and children 12 years of age and older: Take 2 caplets every 6 hours while symptoms last. Do not take more than 6 caplets in 24 hours, unless directed by a doctorDo not use more than 10 days unless directed by a doctor.Children under 12 years of age: Do not use this extra strength product. This will provide more than the recommended dose (overdose) and could cause serious health problems. Store at controlled room temperature 20-25°C (68-77°F).read all product information before using.TAMPER EVIDENT: DO NOT USE IF IMPRINTED SAFETY SEAL UNDER CAP IS BROKEN OR MISSING.